H.B.A. 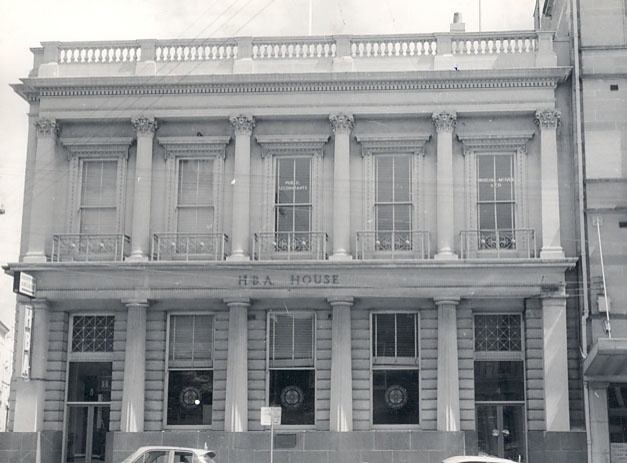 House, is a two storied building constructed for the Union Bank of Austrialia, to designs of architect Leonard Terry, in 1863-64. The ground floor facade is designed as a five bay colonnade of engaged Doric columns, a motif repeated above using Corinthian columns to support the balustraded parapet. Banded rustication faces the ground floor above the plinth and the hooded first floor windows have balconettes. H.B.A. House is a building of very considerable architectural importance and forms an essential part of the streetscape and townscape of the historic city of Ballarat. The building is in the Conservative Classical style and is one of the finest extant designs of Leonard Terry. The superimposed trabeated system is extermely rare if not unique. The former Union Bank forms an important contrast with the other Terry-designed banks in Lydiard Street and is relatively intact. H.B.A.House,is externally largely intact, new doors and signs having been added and inappropriate paint colours used. Parts of the interior are intact.